Facebook's CEO is set to testify in front of Congress today. Here's what experts will be watching. 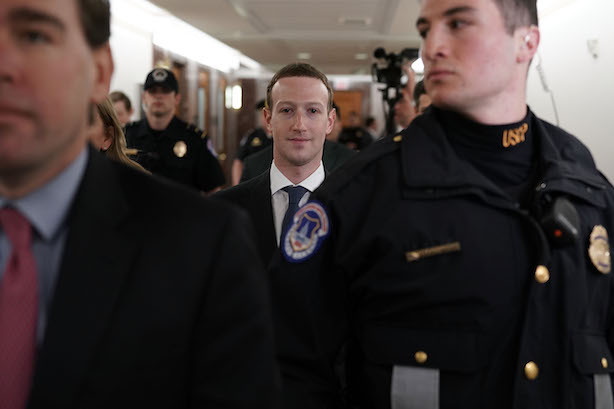 Mark Zuckerberg got a brief reprieve from the lead spot in Monday evening’s news cycle, thanks to the raid of Trump attorney Michael Cohen’s office (New York Times). That’s likely to change today when the Facebook CEO is due on Capitol Hill to testify about user data collection (CNBC). All of the takes. Recode: Zuck can handle it. Financial Times: 6 questions from Congress Zuckerberg won’t like. CNN: Zuckerberg’s growing up moment. The Verge: Tough questions to come from both sides of the aisle. Bloomberg: The end of the ‘move fast, break things’ era. Our favorite: Zuckerberg testimony bingo (Quartz). Speaking of Cohen, the longtime personal attorney to President Donald Trump is being investigated for possible campaign finance violations and bank fraud (Washington Post). Trump broke his relatively long Twitter silence on the matter on Tuesday morning, calling the raid "A TOTAL WITCH HUNT!!!" (caps and unnecessary punctuation his) and saying "attorney-client privilege is dead!" Laura Ingraham was back on Fox News last night. The show had plenty of the conservative firebrand blasting "Stalinist" critics, whom she called "speech czars" (Daily Beast). It did not have plenty of ads, however (CBS News). Allstate became the latest marketer to drop The Ingraham Angle, telling staffers in a memo her comments about activist David Hogg are "inconsistent with our values" (The Wrap). The Simpsons is facing criticism for its brush-off response to a documentary critical of its outdated "Apu" character. Hari Kondabolu, the comedian behind the documentary The Problem with Apu, called the show’s response "sad" on Twitter (Los Angeles Times).